Congratulaions to Adrienne Howell who was awarded a BEM (British Empire Medal) in the 2019 New Year's Honours List. A delightfully diverse, debut collection of beautifully crafted short stories which breathe new life into the form. Some entertain and reassure, others surprise, tantalise or shiver with magical thrills. All reveal the ordinary in the extraordinary, the extraordinary in the ordinary. Amusing, disturbing, spellbinding, witty, enchanting, shocking, consoling . . . discover worlds you might not have known existed. (opens in a new window or tab) then post. The ebook of The Fox's Lament will be available in both epub and mobi formats during April. Christopher Nicholson, author of Among the Summer Snows and Winter. 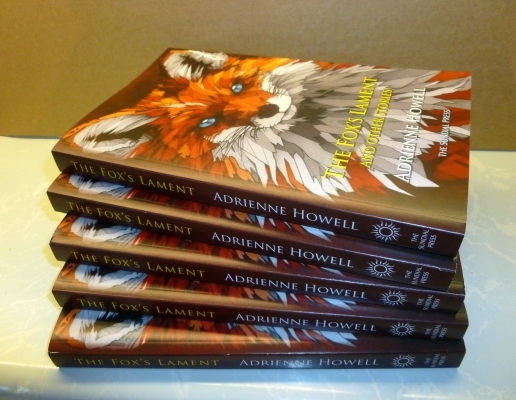 'Adrienne Howell has curated other authors' writing for more than two decades through the inspiring literary festival she founded in a small Wiltshire town. While I might imagine her absorbing the best of all she has heard and read to become what she is now, I think that would be failing to recognise her innate originality. 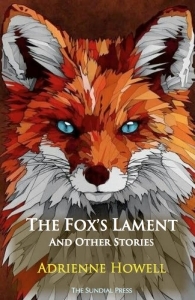 There are nineteen short stories in The Fox's Lament and no two are alike. Each one surprises you up to the last page and sometimes beyond because it may be another two or three minutes before you say to yourself, "Ah! Now I see." They seem simpler than they really are, until you come to the end and look around in surprise at the unexpected place they have brought you to. The book takes you from the horrors of working in the felt hat trade, through the eery pathos of a ghost left at the altar to the stylised humour of detective with a fondness for alliteration via a crutch called Arnie Arnold. James Long author of The Lives She Left Behind and Ferney. "I hail from an old Mere family and have lived in this small Wiltshire town most of my life. I attended Mere primary schools and then Shaftesbury High School for Girls. I trained as a teacher and taught locally, but have also been employed in other jobs. My late husband and I were both active in local brass bands for many years, including Mere, Gillingham and Wincanton bands, and in the running of the Mere Solo & Quartet Contest. In 1996 I became a trustee of a newly formed charity – The Mere & District Linkscheme - which was to provide volunteer transport and care to ten parishes of this rural community. 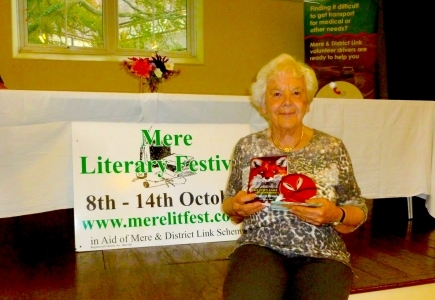 Charged with finding fund-raising ideas, I founded the Mere Literary Festival the following year and have organised it, and its writing competition, for 22 years. 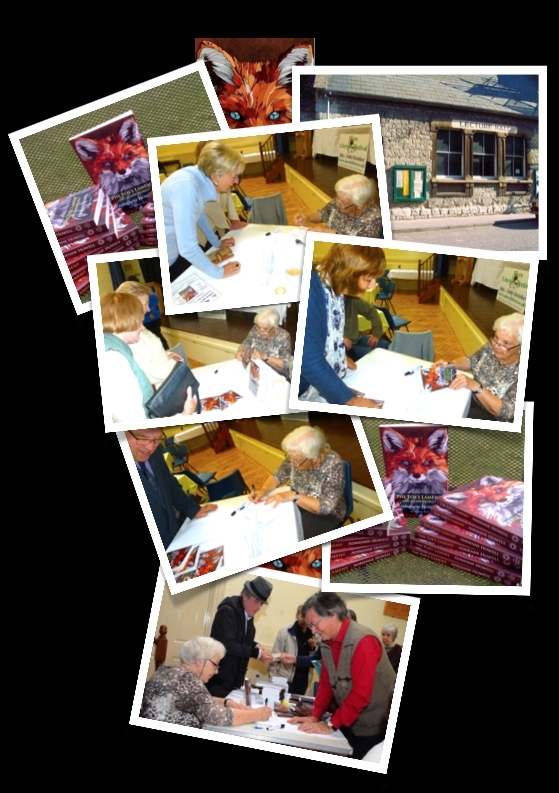 About the same time I founded PennyBank Writers – the Mere & District Writing Group – which meets once a month in Mere. I have won a number of short story awards including the Winchester Writers’ Conference, Wells and Lichfield competitions. I have compiled performance readings for both PennyBank Writers and the Mere festival. One, on Edward Thomas and his links with Wiltshire, was commended by the Edward Thomas Society and by his daughter. It was revived for the 2017 festival to mark the centenary of the poet’s death and performed by Mere Amateur Dramatic Society (MADS). My one act plays have been successful in both the Somerset County and Woolstore Theatre One Act Play Festivals. I have won Best Original Script on three occasions and twice been short-listed for the George Taylor Award. My full length play, The Weatherman’s Harvest, was given a rehearsed reading at The Watermill Theatre, Newbury, and the Christmas fantasy, Sing Nowell, is published by Schoolplay Productions Ltd."
Adrienne — What is the first book you remember reading? I can’t remember a time when I couldn’t read. My mother taught me before I started school at the age of four – but titles escape me. I read Forever Amber at about the age of ten but also enjoyed Enid Blyton. I enjoyed school particularly Junior/Primary school in Mere. I was eager to learn and, as a tomboy, enjoyed the rough and tumble of the playground and after–school ‘gangs’ roaming Plantation and the Downs. That didn’t fit quite so well at the next stage, the Girls High School, where the Headmistress complained, ‘Adrienne speaks to me like she speaks to the girls in the playground’. My mother did not reply! At Junior school I got carried away discussing a play my friend and I were planning and got sent home for talking in class. I refused to go back claiming that as he (the Headmaster) had sent me home, he could come and fetch me. Needless to say, my mother wasn’t having any of that nonsense! Perhaps he was secretly amused as our Friday afternoon plays were allowed to continue. What were the first pieces of writing that you produced? E.g. short stories, school magazine, etc. Those Friday afternoon plays which an amazing and brilliant headmaster allowed at primary school. Most now forgotten but I remember a dramatization of Bush Christmas – a novel I’d read and enjoyed. (In deepest Wiltshire, I hadn’t seen or heard about the film). I made it into a play for the Christmas entertainment in my last year at primary School. The thing I remember about it now was that I blacked up with something (boot polish?) to play the Aboriginal and then couldn’t remove it for the party which followed. I wanted to be a trumpet player – but neither that nor being an author were considered ‘proper jobs’ – far too risky in view of the struggle my mother had had to keep myself and younger brother in full–time education well beyond the age we could have been working. I went into teaching which I enjoyed and wrote a number of plays and shows for school performance. Who were your role models? Which writers have influenced you the most? Who do you most admire and why? I don’t recall having role models. I studied and mainly taught Religious Education so the language of the King James Bible must have been an influence. I’ve never worried about starting a sentence with ‘And’. Far too many really good writers for me to choose one. I do admire the many people who write just because they enjoy it and love working with words. As organizer of the Mere Literary Festival competitions over two decades, I know there’s an enormous amount of talent about. I think playing a musical instrument (I played in a brass band) helps in the understanding of rhythm, phrasing, cadences and the final chord. How words sound when read aloud or in performance is important to me. 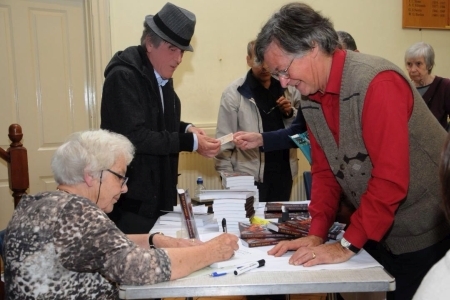 I enjoy doing themed readings at events with PennyBank Writers – the Mere & District Writers Group. When my husband and I lived on the outskirts of Mere I had a large study and a large second–hand office desk. Now I live in Mere on the site of my grandfather’s old cottage, and have a much smaller study – fortunately the desk just fits. Name your favourite literary hero and villain. Difficult, but I think Death, as the narrator of The Book Thief by Markus Zusak, is both a brilliant hero and villain. ‘Time is of greater value than money’ & ‘Never let the sun go down upon thy wrath’. This is an impossible task so I have chosen five books that have meaning for me for special or sentimental reasons, and which I still possess. Name your top five favourite composers/singers/musicians. What jobs did you have before you started writing and since? I was in teaching for a number of years but considered part–time at 4½ days per week and so lost this job when there were financial cut–backs. I then worked in a local office and in my spare time began studying writing. I felt I was making progress when this, too, ended through an illness that went undiagnosed for far too long, wiped much of my memory and vocabulary, and was the most frightening time of my life. I won’t bore you with details except to say that my story ‘Sunday Best’ is based on that experience and I have Bristol Dental Hospital to thank that I didn’t end up like the character Old Jonah. Recovery and re–wiring my brain took a long time but once back to normal life, I started the Mere Literary Festival and PennyBank Writers. If your house were burning down, what would you save? who went down on HMS Hampshire – by which time …. How do you write each story, i.e. do you block out the narrative first, take each page at a time, create the central character, build a cast of characters? I’m glad of the i.e. or I would have been tempted to put ‘with a pencil and from left to right’. Actually, I do write longhand in pencil on lined paper before typing a paragraph or whatever into the computer. I think I fall into the ‘take each page at a time’ category. I’m not a good example as, according to all the ‘How to Write’ wisdom, I do everything wrong which will explain why I’m very slow. I edit as I go along (Wrong!) and seldom move forward until the paragraph sounds reasonable right (Wrong!). From an initial idea I usually have a title, the beginning and probable ending in my head and then work out how to get from start to finish. I chip, chip away – a bit like sculpting – until I get there but, as it’s not set in stone like sculpture, things can be altered. I often write myself notes and ‘what if?’ questions about the story or characters and go away and think about the answers. Once a story is on the computer and printed out, I read it over and over –spontaneous improvements often result. What personal experiences do you feel have informed your writing? Do you have a connection with or fondness for particular characters or locations? Stories told by my mother about her childhood and life inspired several stories. My family have lived in Mere for generations so I have a great sense of being rooted here and having a connection with the Wiltshire countryside and people. What do you do when you are not writing? How do you relax? What are your hobbies? I’m a member of the Link Scheme, Mere Rivers Group, PennyBank Writers and Mere Amateur Dramatic Society (MADS) which keep me quite busy. I enjoy word puzzles and am a keen Countdown fan – I give myself a tick if I equal the contestants and one star if I beat them which is very good for one’s morale! I also like going out with friends and entertaining. Are you currently working on a new story (stories)? I’m currently working on the 22nd Mere Literary Festival (which is to be my last as organizer) and a revival of my play, Katie’s Party, which MADS has chosen for its Autumn production. Sundial, silent herald of Time's silent flight!